Corona Extra, better known as Corona and labeled as Coronita in Spain,is a brand of pale lager owned and produced by Cerveceria Modelo at a number of breweries in Mexico. It is one of the best-selling beers in Mexico and is one of the top-selling beers worldwide.Corona beer is available in over 170 countries. 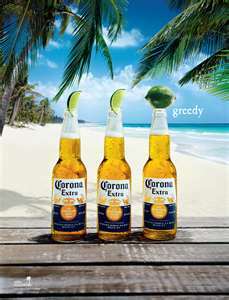 In the United States, Canada, Australia and the United Kingdom, Corona is commonly served with a wedge of citrus fruit, usually lime or sometimes lemon, inserted into the neck of the bottle, adding tartness and flavor. According to Sinebrychoff, a Finnish company owned by the Carlsberg Group, Corona Extra contains water, barley malt, rice and/or corn, hops, yeast, antioxidants (ascorbic acid E300), and propylene glycol alginate E405 to act as a stabiliser. Corona beer is available in a variety of bottled presentations, ranging from the 190 ml (6.4 U.S. fl oz; 6.7 imp fl oz) ampolleta (labeled Coronita and just referred as the cuartito) up to the 940 ml (31.8 U.S. fl oz; 33.1 imp fl oz) Corona Familiar (known as the familiar, Litro or Mega). A draught version also exists, as does canned Corona in some markets. A widely found explanation for the origin of the distinctive 'crown' logo from which Corona takes its name since 1925, says it was based on the crown that adorns the Cathedral of Our Lady of Guadalupe in the town of Puerto Vallarta. This cannot be, as the tower that supports the crown was only erected in 1952, the crown itself being installed at the top in 1963. In Spain, the beer is branded as "Coronita" (literally, little crown), as renowned wine maker, Bodegas Torres owns the trademark for "Coronas" since 1907. The packaging is otherwise unchanged. In the United Kingdom and the United States, smaller, 210ml (7 fl. 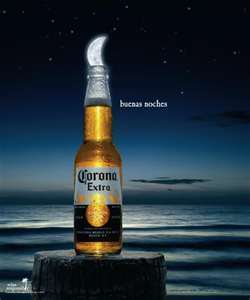 oz) bottles of the beer are also branded as "Coronita".